SMT print assembly is one of our specialities. Electro-Watt’s SMT line needs little time for setup and adjustment. This offers you a wide range of benefits, from the rapid assembly of large runs, to the processing of small runs and prototypes. And even those small quantities are of the highest possible quality at a reasonable price. We are right up to date with the latest developments in SMT, from the ever smaller and more complex housings to the most modern connection techniques. 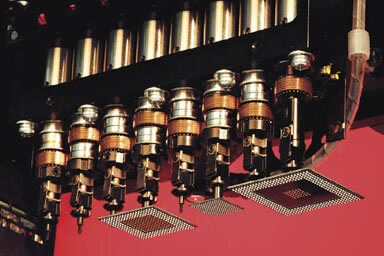 Conventional components are placed on the printed circuit board using computer controlled assembly benches. This highly accurate way of working reduces the chances of assembly faults to an absolute minimum. Read more about the components we can fit. Read more about the techniques we have mastered.